MANSFIELD — The Richland County Public Health department is urging residents to use extra care to avoid heat-related illness (known as hyperthermia). With temperatures approaching the 90s, peoplesuffer heat-related illnesses such as heat stroke and heat exhaustion when the body’s temperature-control system is overloaded. Sweating is the body’s natural way of cooling itself. In some situations, especially in periods of high humidity, sweating alone will not provide an adequate release of body heat. Conditions that can limit the body’s ability to regulate temperature in hot weather are old age, obesity, fever, dehydration, heart disease, poor circulation, sunburn and drug and alcohol use. Among those at highest risk for heat stroke or heat exhaustion are: Infants and children up to 4 years old; People 65 and older; People who are overweight; People who over-exert during work or exercise; People who are ill or on certain medications. Friends and neighbors are urged to periodically check on the elderly and those with illnesses, as they are among the highest-risk groups for heat-related problems. Drink cool (not cold) fluids. Active people should drink two to four glasses (16 to 32 ounces) of cool, non-alcoholic fluids each hour. Heat-related symptoms can come on quickly. 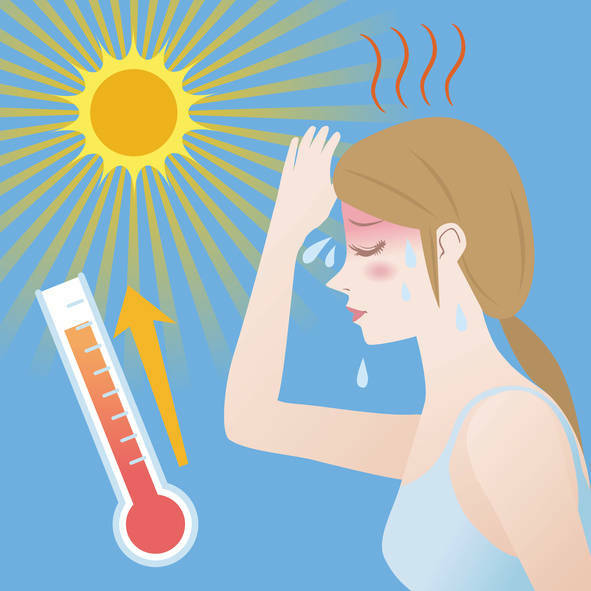 Symptoms of heat exhaustion are: heavy sweating, paleness, muscle cramps, tiredness, weakness, dizziness, headache, nausea or fainting. People experiencing these symptoms should be moved to a cool, shady or air-conditioned area, and provided cool, non-alcoholic beverages. Because children’s bodies do not adjust to temperatures like an adult, their body temperatures warm three to five times faster than an adult. Children left in cars is the most common reason for childhood death due to heatstroke. Through June 13 or this year, 12 children have died in the U.S. due to heatstroke by being left in cars. The average per year of child deaths from heat stroke since 1998 is 37. Temperatures inside a car even on a mild day (70°) can rise as much as 43° in an hour. Cracking a window does little to help.